@thelogosmith Hi Graham, Just looking into copyright for fonts/typeface used in a logo I’m working on – would you have any advice on this? When I saw that Tweet in my Twitter timeline I rattled off half-a-dozen or so replies, and realised it would probably be somewhat more practical, and useful, to summarise them in a post. 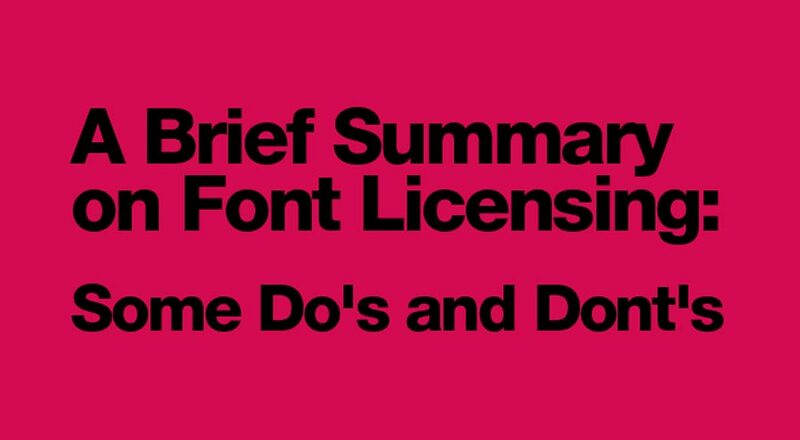 Here is that post: a quick run through of the main do’s and don’ts with the subject of Font Licensing, commercial use, legal and moral right’s and wrong’s. For the most part, the main gist of font licensing pretty straightforward, but I think a number of people assume that font licensing is somewhat of a minefield. I’ll start with a summarised conclusion first, which ought to set you the right course. Simply put: it is safer to consider any font, any typeface family, that you purchase, will have licensing restrictions when it comes to commercial applications. That is to say, if you buy a commercial font, and use it in a logo design for a client, you have taken the 1st step to moral and legal safe ground. However, if you borrow a font/typeface, and use it in a commercial sense, for you or for a client, then you are almost certainly breaking the law. That the former is bad, and the latter is good. Buy is good, borrow is bad. OK? Now please do remember: Each font foundry, each typeface designer, will have their own unique licensing arrangements that come with their fonts and typeface families (form hereon-in, I’ll refer to both fonts and typefaces as fonts), and so nothing should be presumed/assumed about it’s use. When it comes to small-print, reading a commercial font licence ought to be a priority, and certainly not passed over. The purchase of a commercial font/typeface basically gives you, the buyer, a certain right/freedom to use it as you see fit, for both commercial and non-commercial works. Again with the variety: some fonts come with 1 licence, some come with 1-5 Licences. A font that comes with 1 Licence basically means you can only install the font on one of your own computers. A font that comes with a 1-5 licence means you can safely install the font on up to 5 of your own computers, but no more. If you have 7 computers, and you need the font on all 7, then you ought to buy another instance of the font, giving you freedom to install the font on up to 10 computers. K-Type Standard License: Purchasing a K-Type font grants you non-exclusive rights to use the font commercially on paper, on film, online and embedded in documents. The software may be stored on up to five workstations and output devices. You cannot legally give the font to others or install it on their machines (with the exception of co-workers and your service bureau). Myfonts makes font purchasing, licensing and to whom it should be licensed to, very easy and clear to understand. Myfonts also addressed the specific topic of font licensing and usage within a logo in a post: [Font] Usage in a logo which is definitely worth a read. 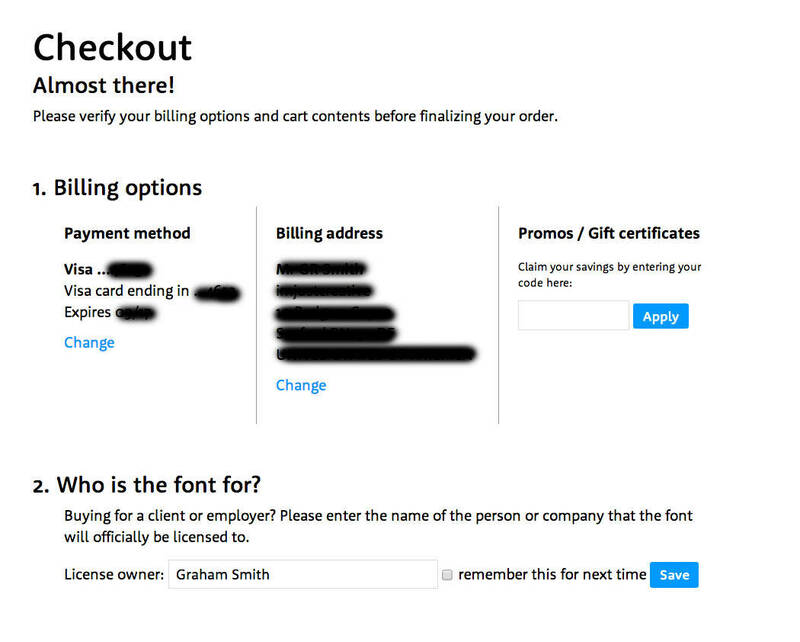 During the checkout process for Alright, you can see in Step 2 (above), one has the opportunity to specify to whom the font will actually be licensed to. So even someone else might have kindly purchased the font for me, they have registered the licence of the font also to me, thus removing them from any legal implications arising out of me copying and distributing the font! Very bad. Contrary to what some people would like to believe, the licence is unique to you, and does not then mean you can give that font to up to 4 of your mates, or clients. This is quite a common misconception, and I think this is where confusion over font licensing exists. This is where font licensing can get a little tricker to get, so here are a few typical scenarios to get your head around. Let’s suppose you are designing a logo for a client who will be using the logo for commercial gain. As the designer, you have no intention to ever use that font again, and basically will forget it ever existed. — In this example the font licence is needed by just one person, ideally registering the client as the owner of the font. You the designer can buy the font, but ideally need to register the licence to the client. But remember, this effectively means as the designer you would be breaking the licensing agreement if you decided to use the font again for another client, and could in all likely hood actually get your first client in trouble, as they are now responsible for that particular font’s licensing. This is a good scenario to avoid. This means the client who purchased and registered the font licence in their name, can use the font for internal and external use, and is useful/required if they decide to use the font as a key part of their brand identity. *The previously mentioned limitations on how many computers the font can be installed on holds true for whoever buys and licences the font. So, if you, the designer, buy and register a font for your client as part of your project/client service, you must ensure the client understand they can only install that font on however many computers the licence is valid for. *If the client subsequently lends the font to other people, who also lend it further down the line to be used commercially, then pretty much everyone associated with the font is doing bad, and are all equally liable. Again you are designing a logo for a client who will be using it in a commercial way. As the designer, you love this font so much, that you anticipate wanting to use the font for further projects down the line for other commercial applications. — This example basically means you need to buy at least two individual instances of the font, and it’s licence. This will allow both the client and designer to install the font on their respective computers, and safely use the font as per the licence description. *The same warnings with the asterisk above hold true, but also some more below. *However, and additionally, if sometime down the line you end up using this same font for another client, then you’ll need to ensure this new client also buys the font, and understands the licence restrictions in it’s use, etc etc. Buying the font once, does not give you free reign to use the font for any number of other people for ever and ever. Each time you use a commercial font in a design for a client, and that design will be used in some commercial sense by someone other than you, you need to assess how the licence might come into question. Who Should Buy/Licence a Font for a Client? There are risks with buying a font for someone else, as you are the one ultimately responsible for any wrong doing accidentally/purposefully made by your client. This isn’t to say you shouldn’t arrange the purchase of the font for your client, but do then ensure that the font purchase, and it’s licence, are correctly registered to your client (assuming you have no plans to use the font yourself as above). I have purchased a number of commercial fonts on my clients behalf, and also suggested in some cases that the client actually buys and registers the licence themselves. If you just want an easy life, then simply ask the client to buy and licence the font themselves. Easy. If you have purchased a font licence for your client, then it’s crucially important that your client understands the limitations, and it’s accepted use, when it comes to their new font. Somewhat confusingly, free fonts for download can come with quite restrictive font licence, and other free fonts are complete with zero-free restrictions. Do not assume just because a designer has generously made the font for free, that it’s also then permissible for you to use the font in a commercial sense. Oftentimes, if you read the licence, you’ll notice that this particular free font CAN be freely used in private works, but CANNOT be used in commercial works, except with express permission from the designer. So for peace of mind, it’s certainly worth reading a free fonts licence, and if you like it so much that it needs to be used for a client logo design, then do the decent thing and ask the fonts designer for permission first. As you can see, the subject of font licensing can get a little murkey if you are not simply fully aware of how font licensing works on it’s simplest level. It’s just safer to assume that font licensing needs to be acknowledged, and that it needs to be checked each time you use a commercial font for commercial use. If you do that then you ought not go wrong. Remember to share the font licensing information and limitations with any client, friend, work colleague who might also be using the font, regardless if the end use is private work, or some form of commercial use. Font and typeface design is a highly skilled, and very technically creative art. These mastercraftspeople toil for months and months, on glyph after glyph, really do deserve recognition and respect. Buying the font is just one part of your commitment to their work you are buying. Using the font as per their licence is just as important, if not more so, then buying it. I have heard, by various font foundries, type designers etc, that they understand the somewhat unpractical expectation of forcing a designer to buy a font for a short period of time needed to create their masterpiece. The problem with this sort of ‘leniency’ is that once you install a font, given/lent to you by someone else, is how often then that font is removed, and never used again. Herein lies the bigger problem with font piracy/using without a valid licence… and probably needs a much longer post/discussion to get to the bottom of. Although I doubt there is such a bottom. In all these cases, the unwritten rule/understanding is that it’s sort of OK to use/install a font that doesn’t belong to you: as long as it’s for a legitimate temporary period. *I’m absolutely not saying that this holds true for evert type designer and foundry, but I think it’s certainly reasonable to assume that this is a reasonable exception to the font licensing rule. But as with a lot of things, don’t count on that being a commercial default.